The Body-Solid G1S packs a lot of power, strength and durability into the smallest footprint available. Centered on a 160 lb. selectorized weight stack, this gym allows over 40 toning, trimming and strength training exercises. From the multi-grip press arm to the contoured, adjustable seat pad, the G1S gives you more for your money than any other home gym on the market. 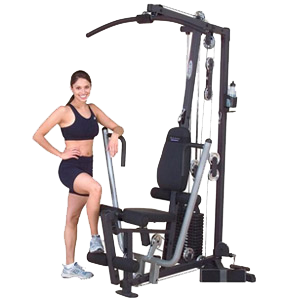 Body-Solid G series gyms use the highest manufacturing standards and the finest quality pulleys, cables, and upholstery. The entire gym is backed by the best warranty in the industry, the Body-Solid In-Home Lifetime Warranty that covers Everything. Forever. Period.